Constructed of a cotton/polyester fabric, the uniform top features 3/4 length sleeves and a V-neck with soft mesh accents down the shoulders. The pants have elastic waists with internal drawstrings. 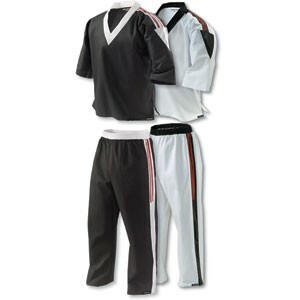 Mesh runs down the sides of the pant and the legs are enhanced on the edges with double red stripes to match the top.